We are located across the street from a cow pasture. A cow pasture with old, brittle fencing. So as you might expect, cows are out a lot... Sometimes their in the road, sometimes our driveway, and sometimes they're in Bill's yard. 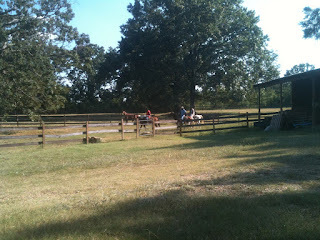 But this weekend they were in the no man's land between our property and the adjoining field. Way back there. It was like a wild west show! A group of real live cowboys from the area came in on their ponies and rounded those cows right up. Our horses are pretty brave out on the cross county course, but they don't hold a candle to these guys. They run full speed through all terrain and then just as quickly as they start, they stop and walk home calm as can be. We need to teach that to a couple of ours. We are especially considering it now that Elliot is rehabing after the summer off, and there is a lot of head tossing and general silliness going on. We may need to call those Blackjack cowboys!